Multiple sclerosis and Guillain-Barre syndrome are similar in that they both affect the nervous system, but the diseases attack nerves in different ways and, therefore, require different approaches to treatment. Multiple sclerosis (MS) and Guillain-Barre syndrome (GBS) are what is called demyelinating conditions that impact the nervous system. Both MS and Guillain-Barre patients experience loss of myelin, which covers the axons of neurons. While multiple sclerosis and Guillain-Barre syndrome are similar in that they both are classified as autoimmune diseases and they both affect the myelin sheath, they affect different types of myelin. Multiple sclerosis is a disease of the central nervous system. This includes the brain and spinal cord. Guillain-Barre syndrome is a disease of the peripheral nervous system, which is the nerves outside the brain and spinal cord. Multiple sclerosis vs. Guillain-Barre syndrome comes down to the cells that make up the myelin. Essentially, the cells in the central nervous system and peripheral nervous system are different. Multiple sclerosis attacks the nerves that send signals to the brain. The disease attacks the myelin, best described as fatty material that protects the nerve. Sadly, any damage to the nerve is irreversible. Since the nervous system is being affected, major functions like movement and vision become impaired. With Guillain-Barre syndrome, the body’s immune system attacks nerves, leading to weakness, numbness, and, in some cases, paralysis. In most cases, GBS happens after an infection. Let’s look at multiple sclerosis versus Guillain-Barre syndrome in terms of numbers. Statistics shows that there are over 400,000 cases of MS in the U.S. Women make up the majority of cases. Sadly, there are about 200 cases of multiple sclerosis diagnosed each week in the United States. Guillain-Barre syndrome is considered rare. Between 3,000 and 6,000 people in the U.S develop GBS. This works out to about one to two people out of every 100,000. In 1976, a small risk of Guillain-Barre was found following swine flu vaccinations. Since that time, several studies have be done to test if other flu vaccines are linked to GBS. In most of the studies, no association was found, but two studies reported that about one additional person out of one million vaccinated people might be at risk of Guillain-Barre with the seasonal influenza vaccine. Multiple sclerosis vs. Guillain-Barre syndrome: Who is at risk? Multiple sclerosis is a disease that usually hits a person between the ages of 20 and 50 years old. People who are diagnosed after 50 often experience a progressive form of the disease. The risk of developing MS increases if a person already suffers from another autoimmune disease or has an infection caused by Epstein-Barr virus. Guillain-Barre syndrome is more common among adults than children. People who are over the age of 50 are at the highest risk of getting the disease. It’s important to understand the symptoms of multiple sclerosis vs. Guillain-Barre syndrome and to know that the signs can vary depending on the stage of the disease. As MS progresses, more symptoms can appear, including those listed below. When it comes to Guillain-Barre syndrome, symptoms are different for each person, but the first sign usually is a tingling feeling in the toes, feet, and/or legs. Some other typical symptoms are listed below. Although no one knows for certain why people get multiple sclerosis, a number of theories are being tested, including genetic causes, environmental causes, immunologic causes, as well as viruses and bacteria. While medical scientists know that the myelin is being attacked, they are still not sure why. We do know that a person with a first-degree relative with multiple sclerosis is at an increased risk of developing the autoimmune disease. 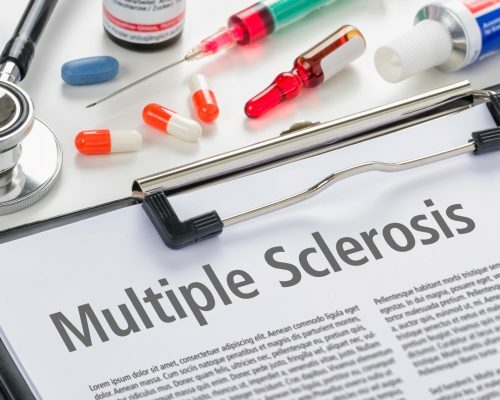 Researchers have also noted that environmental agents can trigger genetic susceptibility to multiple sclerosis and that people living furthest away from the equator have a higher rate of MS. Another important connection is infections. It turns out that infections, such as measles, herpes virus-6, and Epstein-Barr virus, have been linked with multiple sclerosis. These infections have been known to cause myelin inflammation. Researchers don’t know what sets Guillain-Barre disease in motion. What doctors understand is that in diseases where the peripheral nerves’ myelin sheaths are damaged, the nerves can’t transmit signals properly. For this reason, muscles start to lose their ability to respond to the brain’s commands. The brain also gets odd messages that lead to tingling or pain sensations. Since many cases of GBS have followed a viral or bacterial infection, some experts wonder if it is possible that the virus has changed the nature of cells in the nervous system, making the immune system treat those cells as foreign. There is also a theory that the virus confuses the immune system, allowing the cell to attack the myelin. Many people with Guillain-Barre syndrome report that they contracted the disease after becoming ill with either a virus or a respiratory infection. This could suggest that their immune system did not respond properly to the previous virus. Some of the possible triggers for GBS include influenza, pneumonia, mononucleosis, HIV or AIDS, cytomegalovirus (strain of herpes), campylobacter (uncooked poultry), Hodgkin’s disease, or surgery. Below we look at possible triggers in multiple sclerosis vs. Guillain-Barre triggers mentioned above. Recognizing MS triggers is important if people want to reduce flare-ups. Here are the common multiple sclerosis triggers. Keeping on top of signs and symptoms and trying to control triggers is key to avoiding unwanted complications. People who suffer from multiple sclerosis have an increased risk of urinary tract infections since their bladder nerves can be disrupted. Osteoporosis, pressure sores, aspiration, pneumonia, and depression are also complications associated with MS. Some people with Guillain-Barre syndrome also experience complications. They could include, being unable to walk and thus requiring a wheelchair, problems with sense of touch, loss of coordination, and extreme muscle weakness. There are people with GBS that won’t recover completely and will experience muscle weakness for several years. There is a small chance – about one in 20 – of dying from Guillain-Barre syndrome. Normally, this happens as a result of complications during the first few weeks of the condition. Respiratory failure, serious infection, and heart rhythm disorders are usually the biggest factors. Since there is no cure for multiple sclerosis, the approach is to manage the symptoms and try to prevent flare-ups. There are physical therapies, muscle relaxants, and other medications that can be administered to reduce fatigue, discomfort, depression, and other symptoms associated with MS.
Again, there is no cure for Guillain-Barre syndrome, but there are treatments that can ease pain and lessen the duration of the illness. Plasma exchange is one type of treatment for GBS. This involves removing the liquid portion of a person’s blood and separating it from blood cells. The blood cells are then put back into the person’s body, which makes more plasma to replace what has been removed. It is thought that this gets rid of antibodies that might be causing the immune system to attack the nerves. Other approaches include immunoglobulin therapy, which involves getting healthy antibodies from blood donors, as well as pain relief medications, and physical therapy. If someone is going to get Guillain-Barre, they are likely to experience rapid onset of signs that something isn’t right. For instance, the symptoms can appear just a few days or weeks after a person has suffered an infection. Addressing the symptoms early and getting proper treatment helps avoid complications. However, MS is different in that the disease often progresses slowly. Many people who are diagnosed with MS think it is an automatic death sentence, but the truth is, it doesn’t have to be. Literally thousands of people with multiple sclerosis have gone on to live full, active lives. Both researchers and patients who have suffered from MS or GBS have said that “quality of life” is the real concern for them. This means that those who suffer from these autoimmune diseases need as much understanding and support at they can get, not just from healthcare providers, but also from family and friends.